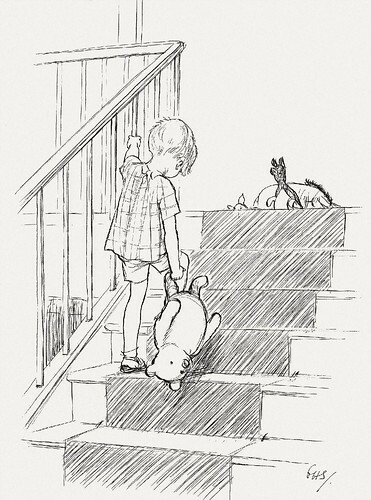 He nodded and went out ...and in a moment I heard Winnie-the-Pooh --bump, bump, bump--going up the stairs behind him. It seems, doesn’t it, that sometimes in our lives we allow ourselves to treat the people that we love–those most precious to us–rather carelessly, if not downright shabbily. The puzzle, the paradox and the wonder is that those people–our friends, family or spouses–continue to love us despite our inconsideration, and even when we drag them along, bump, bump, bump. Sometimes when we can’t be courageous out of faith, we can still be courageous out of obedience. The next time you face fear and the urge to back away from what is right, speak to it as you would a tempter and say, “My Lord has commanded me to be strong and of good courage. Buzz off in the name of Jesus Christ. I have things I need to get done.” God will be with you. Awhile back I posted about the fate of 3 children who came into existence through artificial means. IVF and other infertility treatments which take conception out of the realm of nature and move it into the laboratory are resulting in multiple moral and ethical nightmares. Take this story, from the Chicago Tribune. In-vitro fertilization made it possible for Adriana and Robert Potter to welcome twins Anabella and Matteus into the world. For the same reasons many couples can’t conceive, IVF was their only option if they wanted children of their own. But with that choice came another: what to do with two other embryos created in the same petri dish but never placed in the womb. On that dilemma, the Potters have agreed to disagree for now. If the Elmhurst couple decides they don’t want more children, Adriana Potter believes donating the embryos to advance reproductive technology or treat debilitating diseases would be the most life-affirming choice. “There were sacrifices to help families like us have kids…” — This is from the mom, to whom I would answer: Human sacrifice hardly seems to be a foundation upon which to build your family. Unless you are a Mayan chieftain in the year 1500. Robert Potter imagines having more children to fulfill God’s mandate to be fruitful and multiply. But if they decide to have no more, he favors donating the embryos for another couple to do the same. Viable embryos should not be taken for granted, he said. As thousands of frozen embryos continue to accumulate and pressure mounts to decide their fates, doctors say more families must weigh the promise and perils of adoption and research. I’m not sure that the dad fully understands the issue if he thinks this isn’t about morality but overall, his statement is right: human life should not be wasted. The freedom to make that decision without condemnation is one of the many factors Adriana finds appealing about the Methodist church, where the couple will baptize their children right before Christmas. Raised Roman Catholic in Brazil, Adriana began to drift after a heart-wrenching divorce. She cannot imagine her offspring raised by another family without any control over their upbringing. By devoting them to research, she as their mother would have the final say about their greater purpose in life. But Robert doesn’t trust that every embryo fulfills a greater purpose. He can’t imagine sentencing two potential children to short lives that would end in a laboratory. The Rev. Norma Lee Barnhart, pastor of Elmhurst First Methodist Church, encourages the couple to have conversations with God and with each other. The Methodist church endorses stem cell research, though it doesn’t dictate that’s what a couple should choose. Citing First Corinthians 13:12a letter the apostle Paul wrote 2,000 years ago describing the process of maturing in one’s faith, she prescribes time and patience. “In our faith those decisions are made by the person with God’s help and with the help of the church community,” she said. Okay, so the mother of the Solomon’s wisdom story, this woman ain’t. If you remember the story to which I am referring, King Solomon settles a dispute between two mothers by ordering that the baby be cut in half and given to the two arguing women. 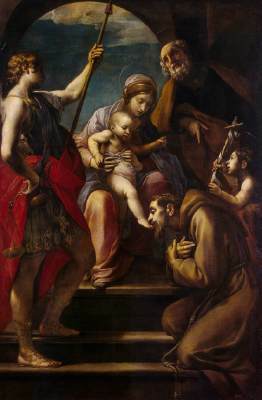 In fear, one mother cries out that instead of killing the child, Solomon should give it to the other mother. The second mother says, yeah, go ahead and kill it, thus proving who the real mother is. A real mother would wish for her child to live, even if that meant with someone else raising it, rather than see him or her die. A fake, selfish, jealous and vengeful mother only cares about her own interests. Adriana Potter: grab your Bible (or borrow your husband’s) and read 1 Kings 13 and then…go take a good hard look in the mirror. My take on this is that the Mrs. Potter has a very tenuous relationship not only with the Church but with Christ’s authority. She left the Church over her divorce (presumably because she couldn’t submit to the Church teaching) and joined a Methodist church not so much because of her husband’s beliefs but because the Methodists have abandoned Scripture for modernism and simply do not care about Biblical teachings on divorce. She wants the children she wants and those she choses not to raise, she wants them destroyed rather than blessing some other family. Fertility Centers of Illinois now stores about 20,000 embryos from about 4,550 patients. Perhaps it is the fact that there are THOUSANDS of little babies in each of HUNDREDS of these puppy mills fertility clinics just staying on ice until they are destroyed purposely or killed in laboratory experiments. Each of these little babies–a million souls?–cost so much in money, time, effort and hope. Every single one of these babies was created–their parents would say–because of the love their parents felt for them. Love. When the parents meet up with them at the gates of Heaven, they can try explaining how much love they felt for them that they gave them over to science to be experimented on alive and dead. Our mother Church is so wise. We need to heed to the wisdom of the Holy Spirit who is guiding the Church. We are leading ourselves astray. We are bringing horrors upon ourselves. In our need, we are creating…destruction. How’s that for irony? Yes, that's right boys and girls! It's ANGEL TIME!!! I have a son who flies through books. I can’t keep him stocked with them. He really likes fantasy novels and he likes thrillers. So what more natural fit than a supernatural thriller? Even better, it is a Christian book written by an acclaimed author, a fallen away Catholic turned atheist who has returned to the Church! This reviewer has never read any of Anne Rice’s Vampire stories, but he has read her more recent fictional books on Christ and her memoir about her life and her conversion. He has seen two of the movies based on her vampire stories, Interview with a Vampire starring Tom Cruise and Brad Pitt and The Queen of the Damned. Rice’s new book is the total opposite of the vampire stories. 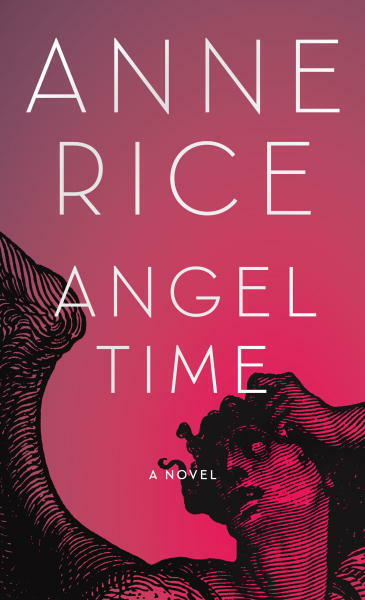 Since her conversion, Rice began writing about Christ, and now about angels. These “angels” are not like the ones imagined by New Age followers. She has studied what Christianity teaches about angels. She has consulted the works of St. Thomas Aquinas and Fr. Pascal Parente’s book The Angels to write about them. According to Christian teaching, angels are disembodied spirits. Each is his own distinct species of angel. There are also various classes of angels or heavenly persons which are mentioned in the Scriptures. St. Paul lists nine classes, or ranks (also called choirs). Only three angels called “archangels” are named in scripture: St. Gabriel, St. Michael, and St. Raphael. There are good angels and there are bad angels. The bad angels are led by Lucifer, otherwise known as the devil or Satan, and by other names. According to Christian teaching we humans do not become angels when we die. We become disembodied souls that will have a human body again at the Resurrection. Anne Rice’s new book is very entertaining, and contains a conversion story of its own. An assassin, Toby O’Dare, has an experience that changes his life so much that he is willing to do anything for God. He wants to make up for all the wrong he has done. That God forgives even assassins is something most of us accept with great difficulty. We humans may think that a notorious sinner is beyond forgiveness, but God does not work that way. This fictional story of Toby and an angel, Malchiah, permits Rice to present a number of teaching moments in the story, if one is alert to them. They are correct according to Christian teachings and the Scriptures, and undoubtedly reflect on Rice’s own life and her conversion (especially clear to this reviewer after reading her memoir). Although, Rice of course was not a notorious sinner her character O’Dare was. Anne Rice researches the historical background for her books and she has done well with this one too. Since O’Dare tells God and the angel that he is willing to do anything to make up for his sins, Malchiah sends him back in time to correct a situation in 13th century England involving Catholics and Jews. One will have to read the book to find out what happens, suffice it to say that the book keeps the reader enthralled — as many reportedly were by her vampire stories, so she is now doing with her angel stories. This book is a first in a series she plans to write while works continues on her fictional series on the life of Christ. Anne Rice must be doing well with these Christian fictional books since some are bashing her for them. This new book is highly recommended to those who want to read good Christian fiction and about angels. So if fiction is your game, I am recommending you put this on your Christmas list. It was on my shopping list, but it’s in the “checked off” column now. Oh, as if it could get better, this is the first in a series so if my son gets hooked, I have a whole line of books I can go back to every gift occasion. Score 1 for mom! Timely post — book recommendations! Ugh, I can’t seem to embed it so here is the link. Enjoy! A Catholic bioethics expert weighs in on the case of Rom Houben, which is quickly becoming one of my all-time most read posts. In an interview with Catholic News Agency, John Haas, President of the Philadelphia-based National Catholic Bioethics Center suggests the case shows the wisdom of Catholic teaching on the duty to provide sustenance for those believed to be comatose. Houben’s mistaken diagnosis was a “perfect example” of why artificial nutrition and hydration should be continued, Haas said. He reported that the U.S. Catholic bishops last week passed a modified version of Directive 58 of the Ethical and Religious Directives (ERDs) for Catholic healthcare. This directive spoke of “the moral obligation to continue to provide hydration and nutrition to patients in a compromised state,” Haas said. “This obligation extends to patients in chronic conditions (e.g. the ‘persistent vegetative state’) who can reasonably be expected to live indefinitely if given such care,” the ERD read. “The bishops have always held to that position,” Haas explained, but some other Catholic voices have not. In 2004, Haas noted, Pope John Paul II delivered an allocution in which he again said it is necessary to provide hydration and nutrition as long as it is “achieving its end” of nurturing the body. Asked about Dr. Laureys’ comments about the difficulty of a patient permanently labeled as “unconscious,” Haas said he hoped health care providers would not have negative attitudes towards such patients. He said the case could help confirm the position of those who oppose physician-assisted suicide, but where the practice is legalized the patients are generally required to be conscious and responsive. However, Houben’s case would be relevant to those with advanced medical directives who say they want artificial hydration and nutrition removed if they are unconscious and unlikely ever to wake. The Catholic tradition holds that hydration and nutrition cannot be removed if a person will die of dehydration and starvation, Haas reiterated. I’m not sure that CNA should have let this last statement stand. I think what the Church is teaching goes beyond small “t” tradition–I’m not sure where JPII’s ‘allocution’ falls. I’m sure one of you will correct me on that, if I’m wrong. I’d also go one further than Mr. Haas to say that–as we have seen time and again (contraceptives, artificial insemination, stem cell research)–the Church is always ahead of the curve. And over at The American Catholic blog, in an article with a wonderfully complete title, Dave Hartline agrees with me. Catholic bioethicist weighs in on paralyzed man thought to be unconscious for 23 years. There is a Catholic musician that I absolutely love. His name is Dante Schmitz. Visit his site and check out his music and his videos. He’s super talented and as a bonus, he’s hilarious! He also tours with Catholic HEART Workcamps and Cory Heimann is his media go-to-guy. I’m going to post one of his videos so you can see how charmingly tongue-in-cheeky he is! Hey! add Dante + Cory + Lonely Ninja + Catholic HEART Workcamp and you get….this. Enjoy!